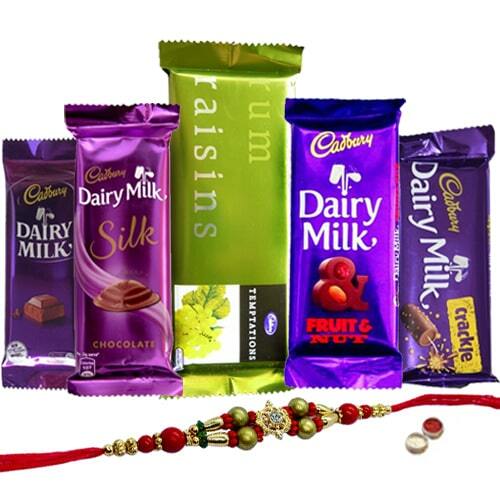 Dedicate your prayers for the good fortune of your dear ones and deck it in the presence of this Breathtaking Assortment of Cadburys Chocolates complemented with a free Rakhi, Roli Tilak and Chawal on Raksha Bandhan. This gift comes with an assortment of Cadbury Dairy Milk Silk, Cadbury Dairy Milk Crackle, Cadbury Dairy Milk Fruits Nuts, Temptation and Cadbury Dairy Milk. The design might change a little.